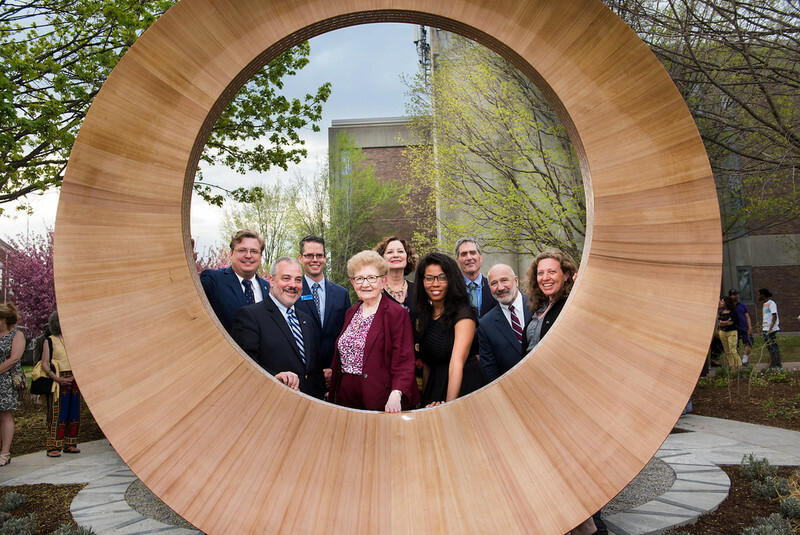 Southern Connecticut State University (SCSU) officials, as well as individuals involved with the establishment of a memorial to honor victims of the 2012 Sandy Hook Elementary School shooting, look through the memorial during a May 4 ceremony. Pictured from left to right are Stephen Hegedus, dean of the SCSU School of Education; SCSU President Joe Bertolino; Dan Camenga, interim associate vice president for institutional advancement and co-chairman of the project; Rita Landino, SCSU counselor emeritus of counseling services and donor to the memorial and garden; Julie Moir Messervy, landscape designer who helped design the garden concept; Carlene Barnes, an SCSU alumna and author of the conceptual design for what would become the memorial; Rich Duca, a sculptor who helped design the memorial and oversaw its production as liaison with Brooklin Boat Yard of Brooklin, Maine; Bill Faraclas, SCSU professor of public health and co-chairman of the project; and Jana Bryan, a landscape architect and lead project designer. NEW HAVEN - Southern Connecticut State University (SCSU) held a ceremony on May 4 to mark the dedication of a remembrance garden and memorial to honor the four victims of the 2012 Sandy Hook Elementary School shooting who had ties to the university. The SCSU Sandy Hook Alumnae Remembrance Garden - located behind the school's Jennings Hall - includes a wooden sculpture with four circles of fiber optic lighting inside. The sculpture was initially designed by Carlene Barnes, who was then a Southern student, and constructed by Brooklin Boat Yard, located in Maine. Brooklin Boat Yard used specialized techniques usually reserved for constructing the finest wooden boats. Each circle of light represents one of the four alumnae who were killed: Dawn Lafferty Hochsprung, who earned a Master of Science degree in 1997 and her Sixth-Year degree in 1998; Anne Marie Murphy, who earned a Master of Science degree in 2008; Mary J. Sherlach, who earned a Master of Science degree in 1992; and Victoria Leigh Soto, who was pursuing a master's degree at the time of the shooting and was awarded her degree posthumously in 2013. The first part of the ceremony included greetings from William Faraclas, professor of public health and co-chairman of the Reflection Garden Council, and a video to welcome everyone from SCSU President Joe Bertolino. Other speakers included Stephen Hegedus, dean of the School of Education; Julie Moir Messervy, an internationally known landscape designer who helped design the garden concept; Rita Landino, a former SCSU faculty member who is presenting a gift to SCSU; and Louise Spear-Swerling, professor of special education and reading, who also shared a tribute video for the four late educators. The second part of the ceremony was held in the remembrance garden. It included a ribbon-cutting and dedication, as well as a university prayer for peace by SCSU students. "I thank the organizing committee and all those whose talents and insights have helped to create this wonderful memorial space for Southern, and for the community at large," said Dr Bertolino. "For generations to come, this garden will serve as a place of inspiration - an enduring motivation for us to find ways to break the cycle of violence and build a better society for all."